Archive of fourteen (14) President Woodrow Wilson era items. 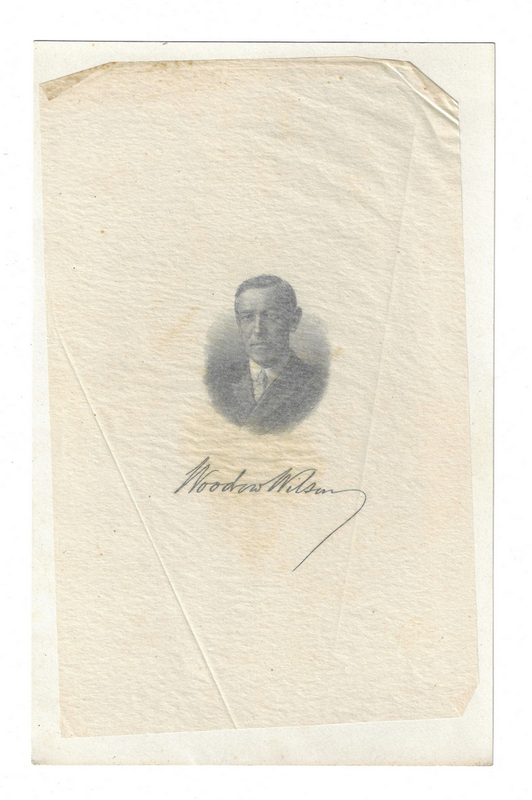 1st item: President Woodrow Wilson and Attorney General James Clark McReynolds (1862-1946) signed appointment, dating July 10, 1913, naming Lewis M. Coleman of Tennessee "Attorney of the United States, in and for the Eastern District of Tennessee…for the term of four years…". 16" H x 19 1/2" W. 2nd item: TLS. One page bifolium letter. From James Clark McReynolds, United States Attorney General, Washington, D.C., to Lewis M. Coleman, Esq., 14 East Lawn, University of Virginia, dated June 14, 1913. Typed on The Attorney General, Washington stationary. 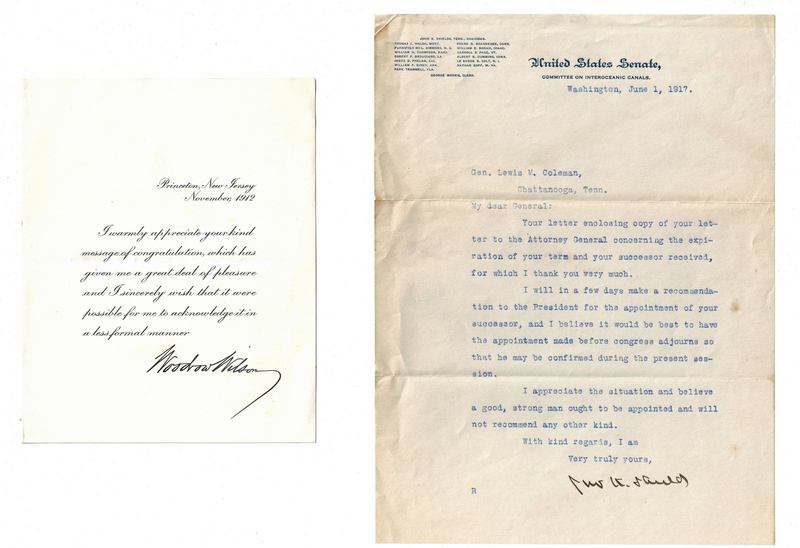 The letter is a response to one that Coleman wrote to McReynolds on the 12th asking to see him. McReynolds states that Coleman is free to "come in at almost any time, and I can probably arrange to see you without much delay. Very truly yours, J. C. McReynolds". 8 1/2" H x 6 1/4" W. 3rd item: TLS. One page bifolium letter. 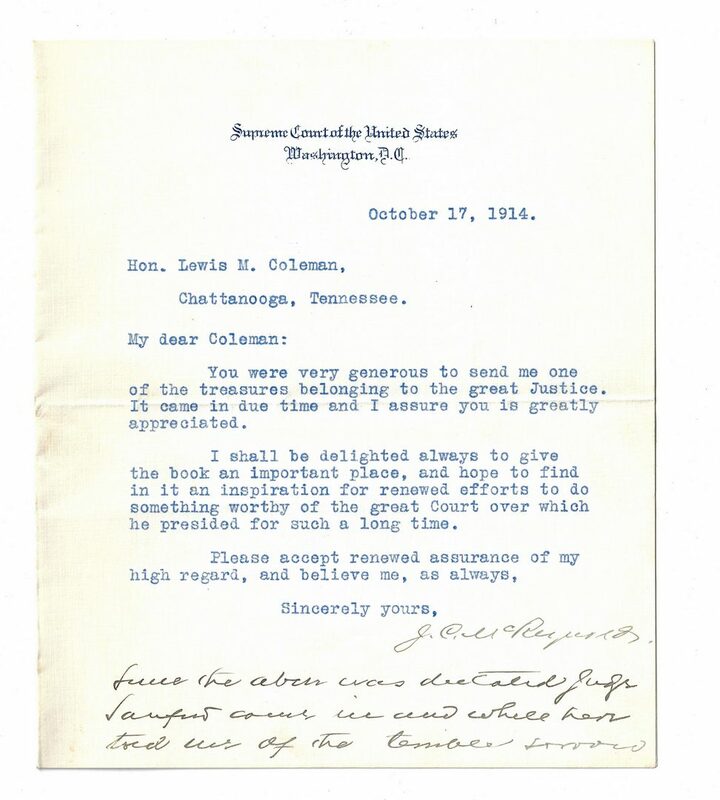 From James Clark McReynolds, United States Attorney General, Washington, D.C., to Lewis M. Coleman, Esq., Chattanooga, TN, dated August 30, 1914. Typed on The Attorney General, Washington stationary. Marked as "Personal", the letter contains McReynolds's appreciation for Coleman's "cordial letter commending my selection for the Supreme Court". He continues the letter with reminiscences, writing "Well do I remember when you first came to Nashville, fresh from the University, and it has given me much satisfaction to watch the success which has attended you at the Bar". Likely in reference to Coleman's ancestor, Confederate Lieutenant Colonel Lewis M. Coleman, McReynolds writes "I have never forgotten they story which you told of dear Colonel M. and the interlinear translation of the Greek author! It made an indelible impression. With best wishes, Sincerely, yours, J. C. McReynolds". 8 1/2" H x 6 1/4" W. 4th item: TLS. One and one-half page bifolium letter. From James Clark McReynolds, Associate Justice of the Supreme Court of the United States, Washington, D.C., to Hon. Lewis M. Coleman, United States District Attorney, Chattanooga, TN, dated October 17, 1914. Typed and handwritten on Supreme Court of the United States, Washington, D.C. stationary. 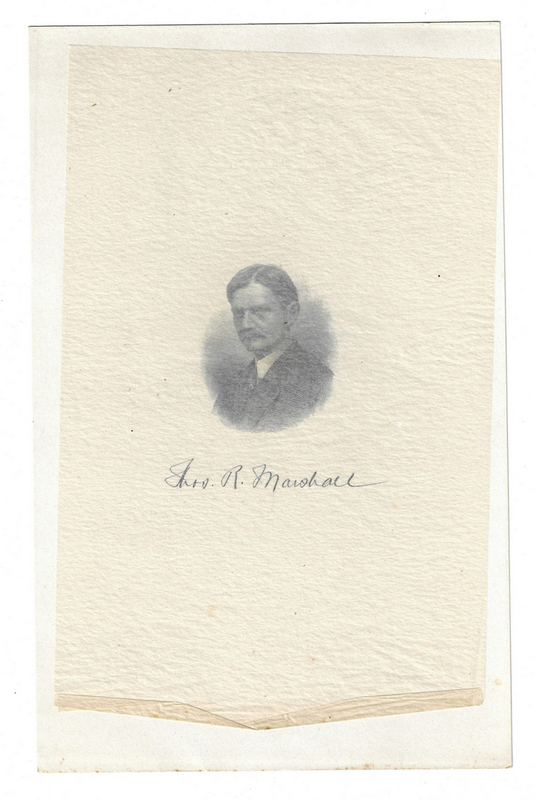 The typed portion of the letter refers to a book belonging to Chief Justice John Marshall, from who Coleman is descended, that he sent to McReynolds, writing "it came in due time and I assure you is greatly appreciated. I shall be delighted always to give the book an important place, and hope to find in it an inspiration for renewed efforts to do something worthy of the great Court over which he presided for such a long time". After his signature "J. C. McReynolds", he includes a handwritten addition expressing his sympathy over the recent death of Coleman's son, Lewis M. Coleman, Jr., who drowned in the Tennessee River on August 28, 1914. Additional signature reading "Sincerely McR" below. 7 3/8" H x 6 3/8" W. 5th-6th items: ALS. Five page, handwritten letter. From Charles W. Rankin, Suzhou (Soochow), China, to Lewis M. Coleman, Chattanooga, TN, dated October 27, 1912. 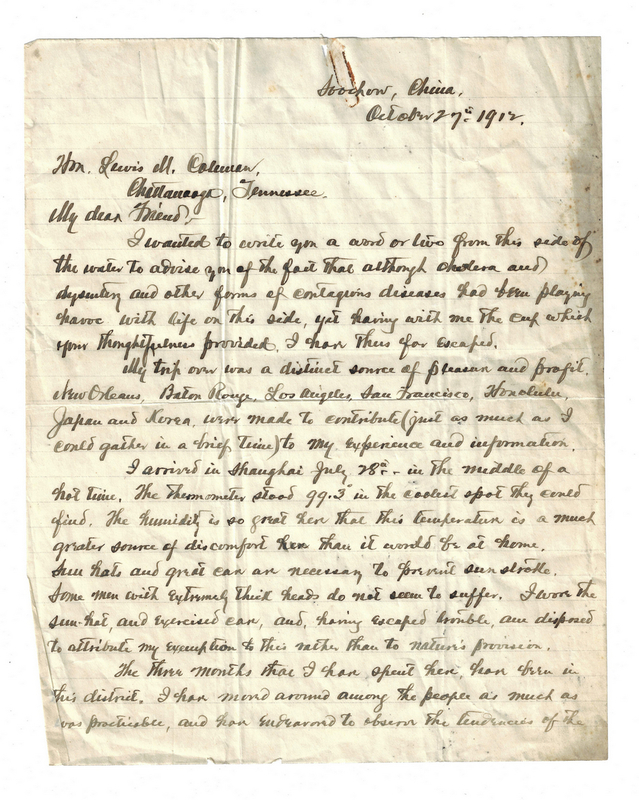 The letter mostly refers to Rankin's recent travels, including his time in China just after the main events of the Xinhai Revolution (October 10, 1911-February 12, 1912), also known as the Chinese Revolution or the Revolution of 1911, writing "…We have a considerable number of soldiers in this vicinity, and the few times I have seen them drill, I have noticed that they are accurate and precise. And they seem to be constantly at it. I have thought it possible that China might be quietly forming an army that would enable her to assert herself a little later…It has, to my mind, seemed so evident that they [are] maneuvering to get a strong hold on China in the time of her weakness, that would enable them to take away her independence and place her under a protectorate later. Of all the governments, China has been led to have a greater regard for the United States. This [regard] was greatly strengthened by the magnanimous handling of the Boxer Indemnity [Scholarship] fund…if Our Government would promptly recognize the New Republic, I have no hesitancy in saying that the Chinese would simply be capacious, in their affection for our Country. And the Chinese Republic is here to stay…One day China will have an army–one that in numbers and discipline, can handle any other known military organization…". He also writes of the impending 1912 Presidential election, stating "The time is near when our President will be elected–The Election will all be over when you shall receive this,–and it will be President Wilson…I was delighted at Mr. [William Jennings] Bryan's action, and thought it thoroughly characteristic, and believe that in him and President Wilson we have two men who mean much to future good government in the United States". As personal note, Rankin request for Coleman to "Take my place in cleaning up Chattanooga. You can do what I couldn't. With–may I say–love, and best wishes, I am–Sincerely–Chas. W. Rankin" with additional typed note reading "Care of University of Soochow, Soochow, China". Also includes TLS from Joseph Patrick Tumulty (1879-1954), Private Secretary of President Wilson, to Coleman, dated March 21, 1913. 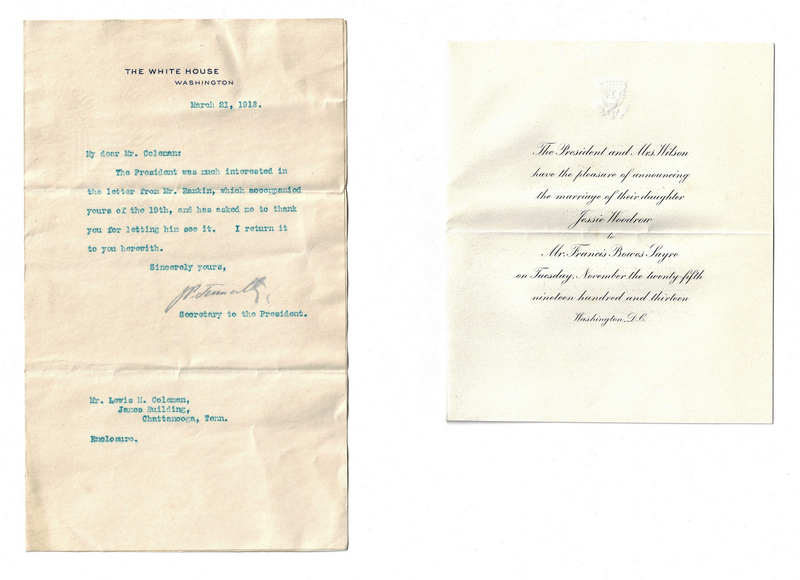 The one page bifolium letter, typed on White House stationary, is directly in regards to Mr. Rankin's letter to Coleman, reading "Mr dear Mr. Coleman: The President was much interested in the letter from Mr. Rankin, which accompanied yours of the 19th, and has asked me to thank you for letting him see it.. I return it to you herewith. Sincerely yours, J. P. Tumulty, Secretary to the President". Rankin letter – 10" H x 8" W. Tumulty letter – 9 3/8" H x 5 3/4" W. Note: Charles W. Rankin was an attorney in Chattanooga, TN. 7th item: TLS. One page typed letter. From John K. Shields, United States Senator from Tennessee, Washington, D.C., to Gen. Lewis M. Coleman, Chattanooga, TN, dated June 1, 1917. The letter is on United States Senate, Committee on Interoceanic Canals stationary with the member of the committee listed with Shields as the chairman, top right. The letter refers to the expiration of Coleman's term as United States Attorney for the Eastern District of Tennessee writing that "I will in a few days make a recommendation to the President for the appointment of your successor, and I believe it would be best to have the appointment made before congress adjourns so that he may be confirmed during the present session". 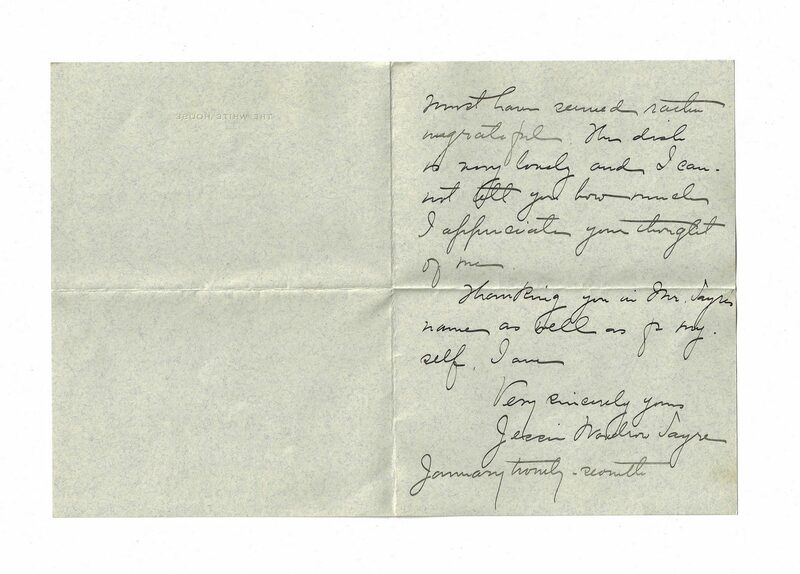 He ends the letter by stating that "With kind regard, I am Very truly yours, Jhn K. Shields". 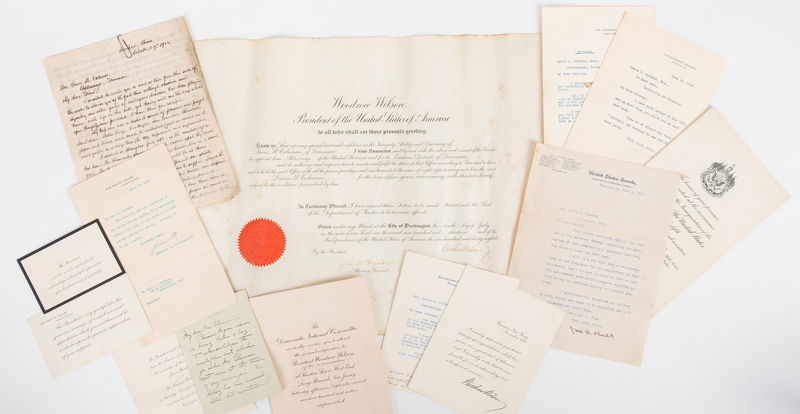 10 5/8" H x 8 1/8" W. 8th item: Printed letter from Woodrow Wilson, dated November 1912, issued in response to a letter of congratulations sent by Coleman upon Wilson's election as President with facsimile signature. The one page, folded letter was printed on Princeton, New Jersey stationary. 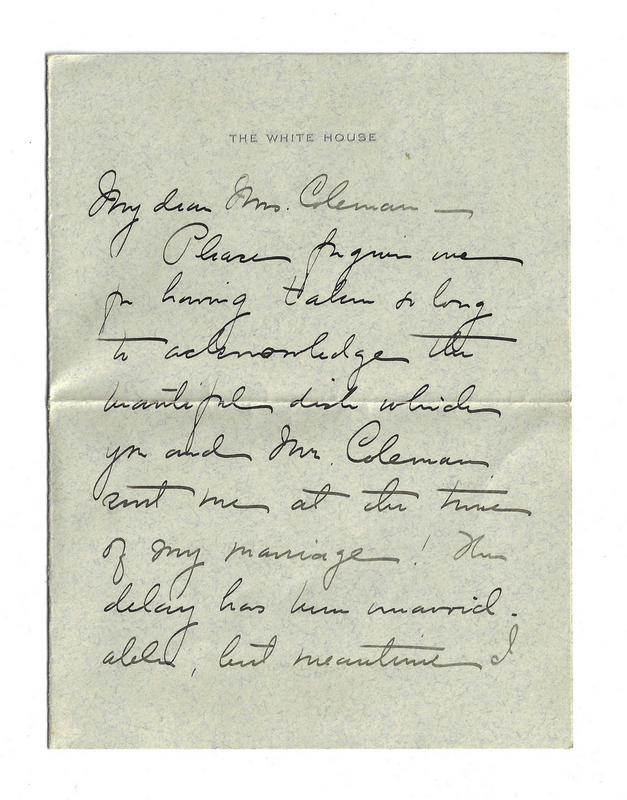 7 3/8" H x 6" W. 9th item: Invitation from President Wilson and Mrs. Ellen Axson Wilson announcing the marriage of their daughter Jessie Woodrow Wilson to Francis Bowes Sayre Sr., to occur on Tuesday, November 25, 1913, Washington, D.C. The one page, folded stationary is embossed with the Seal of the President of the United States, top. 6 3/4" H x 5 7/8" W. Note: This was the eleventh wedding that was held at the White House. Sayre was Assistant Secretary of State under President Franklin D. Roosevelt from 1933 to 1939, when he was appointed High Commissioner to the Philippines. 10th item: ALS. Two page handwritten letter. From Jessie Woodrow Sayre, daughter of President Woodrow Wilson and wife of Francis Bowes Sayre Sr., Washington, D.C., to Julia Wingate Boyd, wife of Lewis M. Coleman, Chattanooga, TN, dated January 27, 1914. The letter was handwritten on The White House stationary. Jessie writes to give a belated thank you for the "beautiful dish which you and Mr. Coleman sent me at the time of my marriage…I must have seemed rather ungrateful…and I can not tell you how much I appreciate your thought of me…Very Sincerely yours Jessie Woodrow Sayre". 5 7/8" H x 4 1/2" W. 11th item: Black-bordered card issued in response to the death of Mrs. Ellen Axson Wilson, reading "The President and the members of his family acknowledge with grateful appreciation your kind expression of sympathy". Card embossed with the Seal of the President of the United States, top. 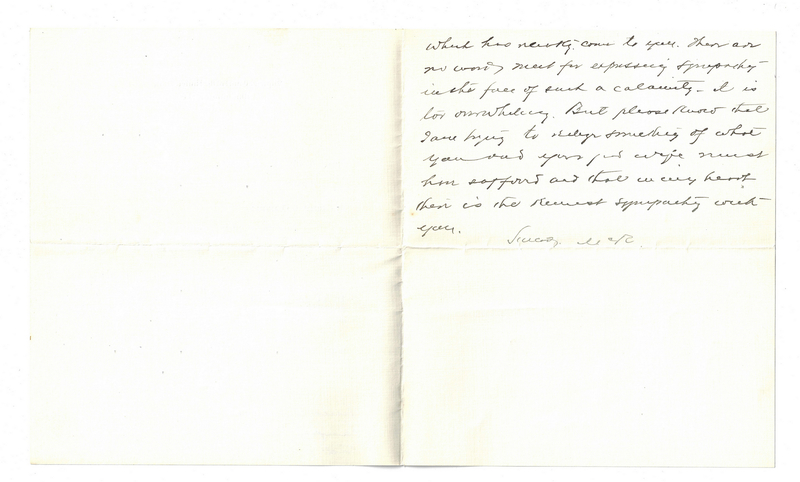 3 3/8" H x 5 1/8" W. 12th item: Card issued in response to the death of Mrs. Ellen Axson Wilson, reading "The President is very grateful for the generous message of confidence and approbation which you sent him, and he wishes to express his genuine appreciation of your support". Message on The White House, Washington stationary. 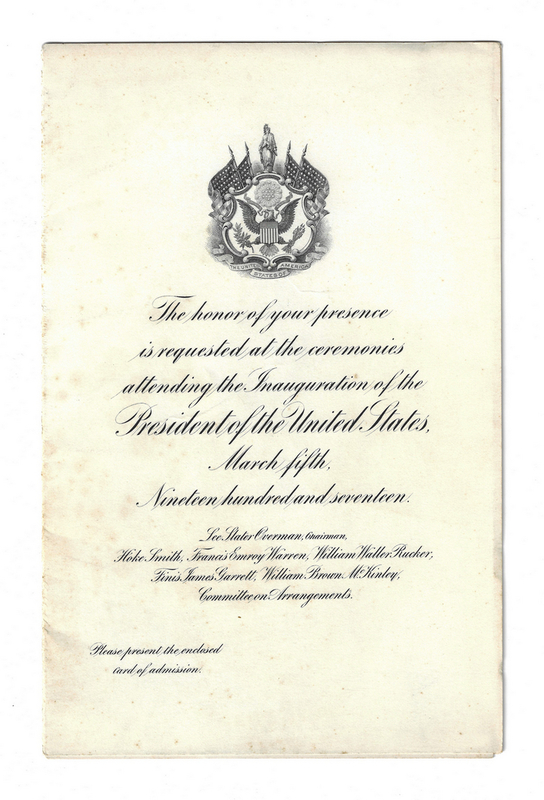 3 5/8" H x 6" W. 13th item: Printed bifolium invitation to the second inauguration of President Woodrow Wilson on March 5, 1917. Steel plate engraving depicting the Great Seal of the United States with Columbia and four flags, above, with the names of the Chairman and the Committee on Arrangements, below. Includes engravings of Wilson and Thomas R. Marshall with facsimile signatures inside the folded invitation. 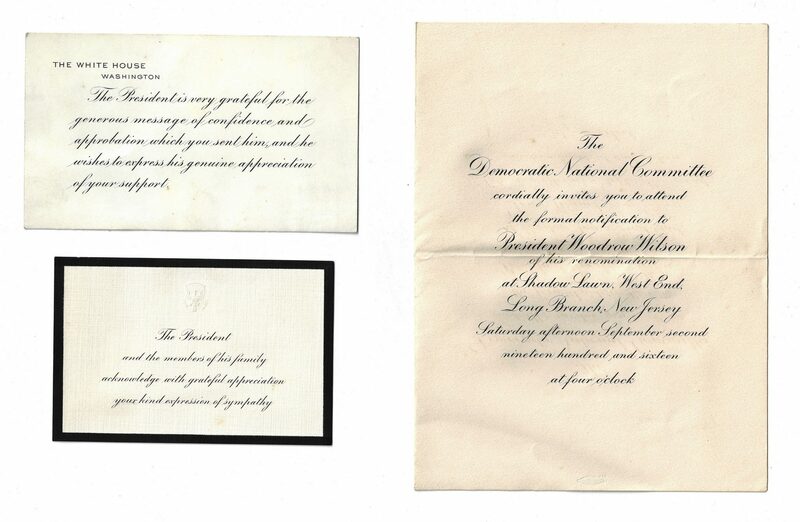 Invitation – 10" H x 6 1/2" W. Engravings – 10" H x 6 3/8" W. 14th item: Invitation from the Democratic National Committee to attend the formal notification to President Woodrow Wilson of his renomination, to be held at Shadow Lawn, West End, Long Branch, New Jersey on September 2, 1916 at 4 p.m. Printed on folded paper 8 3/8" H x 6 3/8" W. Provenance: The Estate of Charles Boyd Coleman, Jr., Chattanooga, TN, by descent from Lewis M. Coleman (1861-1918, U.S. District Attorney, Chattanooga), son of CSA Lt. Colonel Lewis Minor Coleman (1827-1863) and Mary Ambler Marshall, daughter of James K. Marshall and granddaughter of U.S. Chief Justice John Marshall (1755-1835). Lewis M. Coleman Jr. also was related to the family of Henry Dearborn by his marriage to Julia Wingate Boyd, daughter of Annette Maria Dearborn Boyd, great granddaughter of Gen. Henry Dearborn (1751-1829) on her mother's side. CONDITION: 1st item: Overall good condition. Both signatures in strong, clear condition. Foxing spots, surface of document. 2nd item: Overall good condition with few minute foxing spots. Areas of dampstaining, largest 1 1/2", visible on folded page. 3rd item: Overall good condition with few minute foxing spots, 1 1/4" finger print, and tears, largest 5/8", and areas of dampstaining, largest 1 1/4", surface and verso of letter. Signature in strong, clear condition. 4th item: Overall very good condition. Signatures in strong, clear condition. 5th-6th items: Rust stain from paper clip, top center of first page of Rankin letter. Areas of dampstaining, 1/2" x 5 1/4", minute foxing spots, top right of first three pages of Rankin letter. Rankin signature in strong, clear condition. Tumulty signature slightly smudged but overall clear condition. 7th item: Overall good condition with foxing spots, areas of dampstaining, largest 1 1/4", and creases to top corners of letter. Signature in strong, clear condition. 8th item: Overall good condition with few minute foxing spots, scuffs, to surface and verso of letter. 9th item: Overall very good condition with some transfer of ink and minute foxing spot. 10th item: Overall very good condition. Signature in strong, clear condition. 11th item: Overall very good condition with few minute foxing spots. 12th item: Overall very good condition with few minute foxing spots. 13th item: Invitation in good condition with minute foxing spots. Engravings in very good condition. 14th item: Overall good condition with some transfer of ink and minute foxing spots. 1/4" brown stain, visible en verso. 4 1/4" crease, lower left corner.